The construction for (t,sin(t)) and (t,cos(t)) works, because these functions come from the unit circle, we must first form a circle. The cos(x) lies on the y-axis, because cos(0) = 1, it gives us the point (1,0). Sin(x) however lies on the x-axis, because sin(pi/2)=1, which gives us the point (0,1). 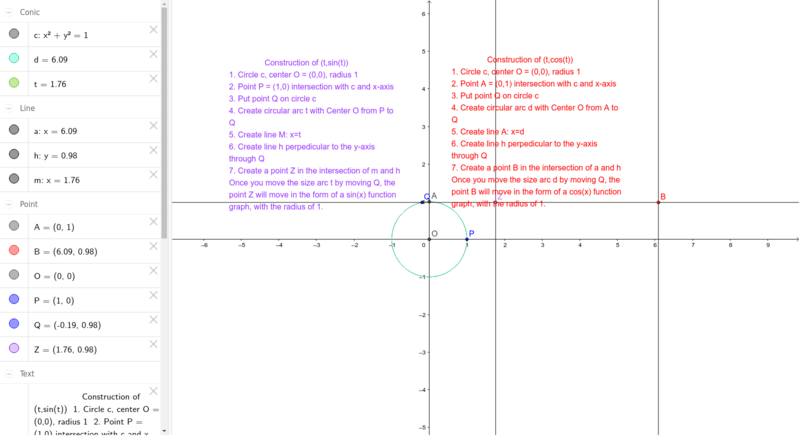 The construction remains the same because you still rely on the intersection with x-t which relies on the curve from the point of cosine or sine. Which allows us to find the points (t,sin(t)) and (t,cos(t)) because we have the proper placement of the points when x=0 and we have x=t (curve).